A mystical treat of ages past, Almas caviar is the rarest and most divine beauty of the Caspian sea, scintillating in its complexity and harmonious in its texture and aroma. Iranian Almas caviar had long been the sole preserve of Shahs, Tsars and Sultans, for it was only these men who ruled absolute over millions, by the divine right of God, that had the right to taste the angelic flavors, and feel the tenderness of these gastronomic pearls over their tongue. The rarity of Almas caviar is so because the sturgeon from which it is produced from is the Albino Beluga sturgeon, who has to reach the specific age of 100 years old before the eggs can be obtained. The roe is a brilliant white, spiritually so, sparkling with a diamond like finish. Offering the most delicious taste, uniquely tender and nuanced in its flavor, with the richness of fresh buttery Beluga and an aroma that is all its own, you will slip into a dreamlike state with the very first bite. To taste Almas is to taste the soul of Iran, bathed in a history that stretches back nearly 3000 years. Almas’ delightfully smooth flavor, peppered with distinct notes of Autumnal nut and abundantly rich cream is offset by a beautifully tender feel, a tenderness that can only come from eggs sourced from a sturgeon that is over 100 years old. The ancient Persians were the first to taste the divine flavors of Almas caviar, believing it to possess strengthening qualities. Indeed they were right, as caviar from the Caspian sea is bursting with an array of essential vitamins and nutrients. 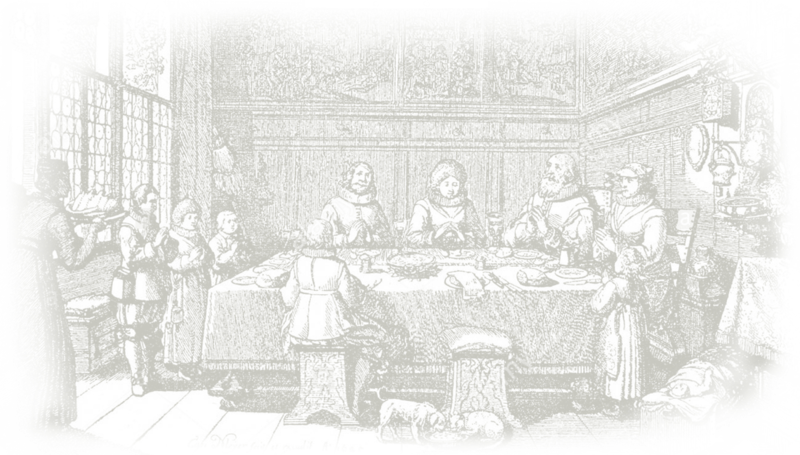 Alexander the Great, the man who conquered India by the time he was 30, is said to have devoured this gastronomic rarity on his first expedition to Iran. He fell so much in love with Iranian Caspian caviar that he would festoon his many banqueting tables with it, laying like glistening pearls atop his feasts. Peter the Great, legendary Tsar of Russia and head of the Romanov dynasty, developed a pronounced taste for Almas and Beluga, securing Almas’ reputation as the perfect representation of regal luxury. Pope Julius II, a patron of the great Renaissance artist Michelangelo and passionate foodie, found something so delicious in Almas caviar that he recommended it to all the monarchies of Europe, securing further Almas’ status as the epitome of luxury. 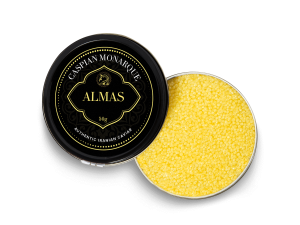 For something so incredibly rare, incredibly beautiful, tipping the boundaries of luxury and containing all those essential components of Caspian caviar, Almas is the most expensive, bewitching all others. For Almas contains the essence of Caspian character, aged yet youthful in taste, texture and aroma. The name Almas is Russian for diamond, and one can imagine that this name was given to this most unique of sturgeon roes not just because of its diamond like look, but for its price. 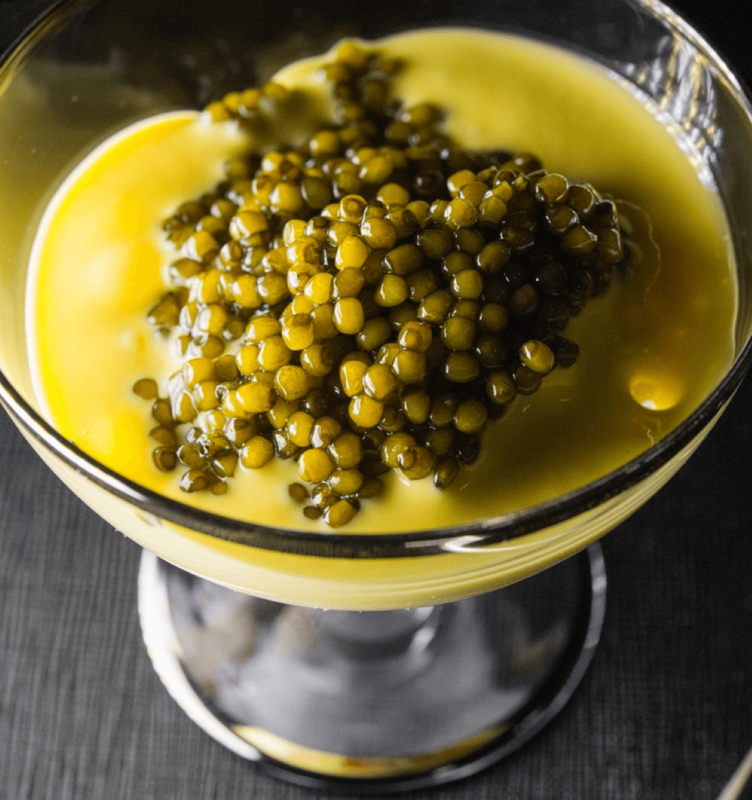 A mere portion of Almas caviar can be as much as 28,000 Euros.